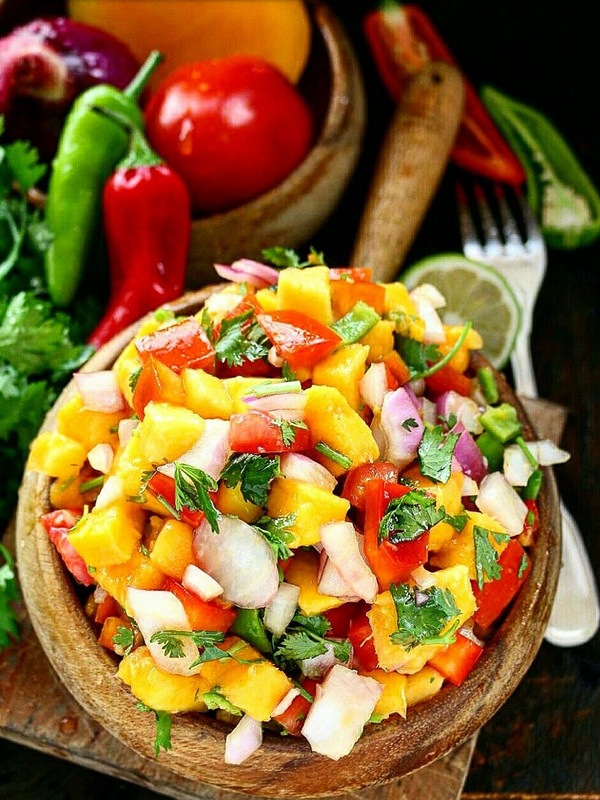 Mango salsa goes wonderfully with fish and chicken dishes. The sweetness of the Mango is not overpowering, and the peppers and onions bring out a bright new taste that I hope will be a nice surprise for you. Mangoes are a great source of dietary fiber, with 3 g per cup, which is 12 percent of the recommended daily value. Dietary fiber helps keep bowel movements regular, helps maintain healthy gut bacteria and may help prevent or relieve digestive conditions like irritable bowel syndrome, diverticulitis, and gastroesophageal reflux disorder. This tropical fruit is also a great source of vitamin C, with 76% of the recommended daily value in one cup, they help lower LDL cholesterol levels too. Chop your tomatoes and remove the fleshy seedy insides. This is to avoid having a wet soggy salsa as the mangoes will release their natural juices. Combine all ingredients in a bowl and allow it to sit for a few hours before serving to allow the flavors to incorporate well.